Hello and welcome to the 130th installment of the SWD. Syrian Democratic Forces and Islamic State clashed in Al-Barid and Hittin districts of Raqqa city, in the former district, SDF destroyed IS’ SVBIED. SDF made advances in Hittin district and is now in control of half of it. South of Raqqa, SDF captured Al-Kamb village from Islamic State. Islamic State’s attack on SAA-held Umm Sosa was repelled after several hours of clashes, all points that IS captured were restored by SAA. Two sick individuals were evacuated from Fuah-Kafraya pocket, in exchange for another two sick individuals from rebel-held part of Yarmouk camp, Damascus. Explosive device targeted Faylaq al-Sham’s vehicle on the road between Kafr Takharim and Armanaz , killing two and injuring several other fighters. Syrian Arab Army advanced in the desert east of Arak against Islamic State, the scope of advances is estimated at 10 kilometers (~6 miles). With today’s advances, SAA reached and captured Zahar Abah area. 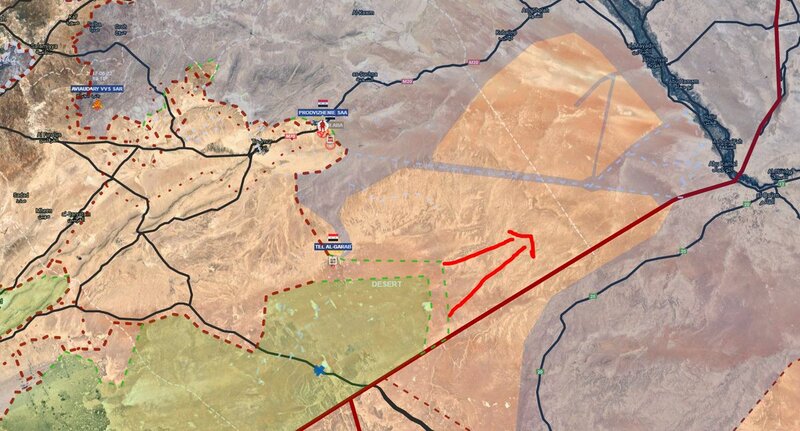 Syrian Arab Army reportedly took control of Wadi al-Lawayzah area from Islamic State. Wadi al-Lawayzah is located south of Abu Kamal (Al-Bukamal) near the border between Syria and Iraq. Syrian Arab Army supposedly made limited advances on Ain Terma – Jobar front, but Faylaq al-Rahman, the group manning the front, reported it repelled SAA‘s attack. In the eastern part of East Ghouta, Jaysh al-Islam also reported that it repelled SAA‘s attempt to advance in Hawsh al-Dawahirah and killed a number of soldiers. According to several pro-rebel sources, Free Syrian Army factions recaptured Bir Qassab from Syrian Arab Army. Rebels launched an attack against Syrian Arab Army, east of Daraa Palestinian Camp. Group of SAA‘s soldiers from the 4th Division was besieged and then reportedly eliminated, 12 soldiers were allegedly killed as they continued fighting and refused to surrender. Rebels have also reportedly destroyed at least three SAA‘s tanks as the two clashed. Mutual shelling of Daraa city by both rebels and SAA, caused civilian casualties in areas controlled by either side. Two civilians were killed, nine injured and electricity cut off to parts of Daraa city due to rebel shelling, while the SAA‘s shelling, killed at least three civilians. Rebel “Daraa Martyrs Documentation Office” reported death of three Free Syrian Army’s fighters due to clashes with SAA across Daraa, confirmed rebel death toll since the 3rd of June is at least 54 fighters. Iraqi forces’ push against Islamic State in Old Mosul today captured Hamedeen mosque and surrounding streets in Bab al-Bayd neighborhood. According to Amaq, the heaviest clashes in Mosul took place near the medical complex, where IS reportedly killed four Iraqi troops as the latter tried to advance. Furthermore, in the same area, IS destroyed a bulldozer. In Al-Shafaa district, IS allegedly destroyed Iraqi Army’s Humvee. Unconfirmed reports suggest that Islamic State executed its wounded fighters hospitalized at the Mosul General Hospital. Islamic State’s improvised explosive device exploded in the downtown Baiji and allegedly destroyed a vehicle carrying Al-Hashd al-Shaabi fighters. In a separate event, IS’ sniper killed an Iraqi soldier in the vicinity of Al-Sadiq, near Al-Tarmiyah. Iraqi forces foiled Islamic State’s SVBIED attack at the main checkpoint for the entrance to the west Baghdad. Driver of the VBIED has been arrested by security forces. Amaq Agency claimed destruction of an Iraqi Army’s armored vehicle with an improvised explosive device in the village of Nofal in Al-Muqdadiya district, north of Baqubah. On the 21st of June 2017 CJTF-OIR has conducted 14 strikes in Syria. CJTF-OIR‘s main focus in Syria at the moment is Raqqa region where they did 14 strikes supporting SDF‘s operations against IS destroying 16 fighting positions, three vehicles and an ammunition cache. Yesterday, Islamic State’s improvised explosive device reportedly destroyed Egyptian Army’s Humvee, a BMP and another vehicle in Al-Qawadis area, east of Al-Arish city, North Sinai governorate. Thanks a lot for these daily updates.